How would you fare at the global negotiating table? You’re a great negotiator at home, but how would you fare on the world stage? Strong negotiating skills in one culture can actually be a disadvantage in another, according to Erin Meyer, author of Getting to Si, Ja, Oui, Hai and Da. Some cultures are emotionally expressive, even in the meeting room. Laughing, raising your voice or physical contact beyond a handshake can be considered normal in countries such as Italy and Spain. Whereas in the United States there’s a level of friendliness with limits. Meanwhile, business cultures in countries like Germany and Japan can find such behaviour inappropriate or unprofessional. How confrontational a person is, or how much they express their disagreement in a meeting room, can differ from culture to culture. To some, confrontation is necessary for clear communication, while others only feel comfortable arguing in more subtle ways. Not all emotionally expressive cultures are also confrontational, and vice versa. 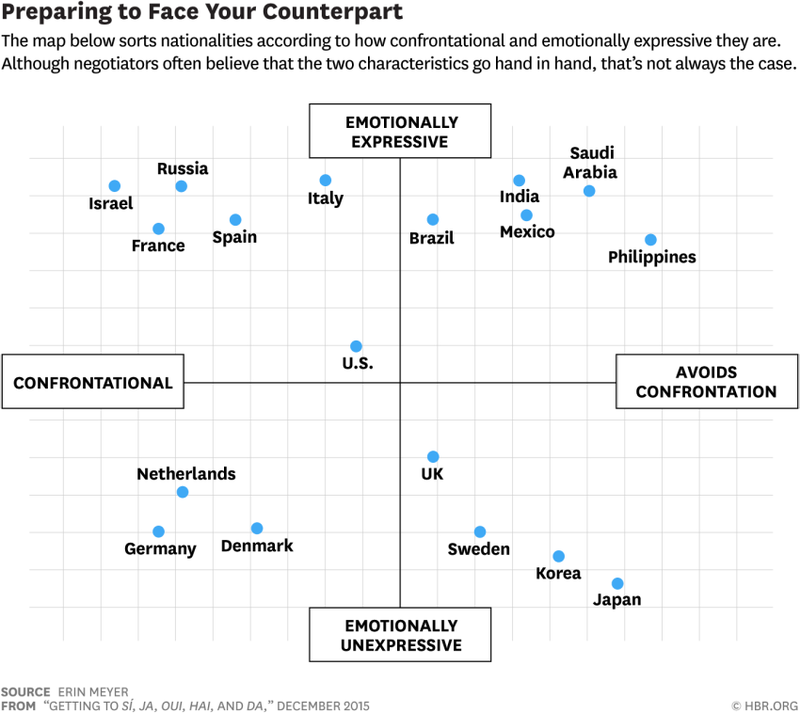 German people have a reputation for being blunt in a calm and rational way, which can be useful in negotiations. In France or Italy, on the other hand, one might expect to see a more passionate exchange. Meanwhile, the cultural stereotype for Saudi Arabian and Filipino cultures is to be emotionally expressive while at the same time avoiding confrontation. But what about those people who do business and conduct negotiations internationally? Meyer identifies five rules of thumb for this sort of discussion. The difference between “I completely disagree” and “I am not sure I understand your point” could make or break a negotation. Do you know which one is appropriate in the culture where you are doing business? Is now the time to assert your opinion, or should you adopt a soft and gentle tone? Cognitive trust is based on how much faith you put in someone’s accomplishments or skills; how reliable they are. Affective trust stems from an emotional closeness, where partnerships are more like friendships. You need to figure out which type is most valued by the culture you’re working in. Did they really mean “no” or are they telling you that the subject needs further discussion? Different cultures view the words yes and no with varying levels of complexity. In some cultures, an email to sum up your conversation could be perfectly normal, while in others it is a clear sign you don’t trust people to remember what you discussed.